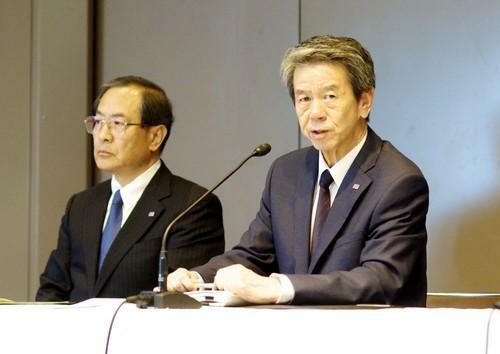 Toshiba CEO and President Hisao Tanaka (right) addresses a press conference July 21, 2015, in Tokyo at which he resigned over an accounting scandal. Chairman Masashi Muromachi (left) will replace him. Executives at electronics and industrial giant, Toshiba, resigned on Tuesday after a committee reviewing its earnings said the company padded its operating profit by about ¥156 billion (US$1.25 billion) over six years to the end of 2014. Leaders at the company, which makes everything from vacuum cleaners to nuclear power plant equipment, were part of a "systematic" effort to embellish the earnings, according to the report by the independent committee, which Toshiba commissioned in May. The sum includes about ¥4.4 billion of incorrect earnings discovered in an internal probe by Toshiba. As the company announced his resignation, President Hisao Tanaka apologised to a packed news conference at Toshiba headquarters in Tokyo. "I recognise there has been the most serious damage to our brand image in our 140-year history," said Tanaka, who is to be succeeded by Chairman Masashi Muromachi. "We take what the committee has pointed out very seriously, and it is I and others in management who bear responsibility." The firm said it would correct its earnings reports in light of the findings by the outside panel, which was scheduled to hold its own briefing later on Tuesday. "A corporate culture existed at Toshiba in which superiors' wishes could not be defied," states the report by the committee, which was led by a former Tokyo prosecutor. It adds that the company president and subordinates "continuously implemented inappropriate accounting practices" to achieve top executives' earnings goals, which were dubbed "challenges."